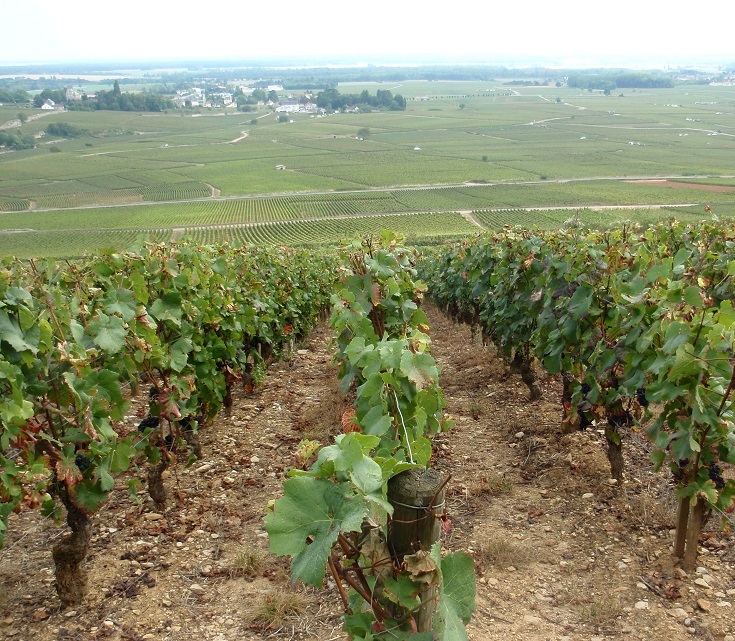 Long ago in the fifteenth century, before France was united under one king, this corner of France was ruled by the Dukes of Burgundy, who were based here in Dijon. It wasn’t until 1477, after the death of the Duke Charles the Bold, that the area came under French rule. Given Dijon’s rich history and abundance of museums and interesting sites, it’s definitely worth taking a day or two to explore the city. There’s a lot to do, so let’s get started! Save this post to Pinterest to read later. There is no better way to get your bearings and explore Dijon than by following the Owl’s Trail (available from the Tourist Office on Rue des Forges near Tour Philippe le Bon—for 2€). This handy booklet includes a self-guided walk that takes in twenty-two of Dijon’s historic monuments, with suggestions for a further three loops around the city. Porte Guillaume (stop 3)—a majestic eighteenth-century arch that was once the gate into town. Rue des Forges (stop 7)—lined with ornate thirteenth, fifteenth and sixteenth-century noble houses. Maison Millière (stop 10)—this timbered house was built in 1483 and is typical of medieval housing throughout France, with a shop on the ground floor and housing for the shop-keeper and his family on the upper floor. Palais de Justice (stop 18) and private mansions (stop 19)—the palace was built in the sixteenth century to house the parliament and is surrounded by stately mansions built for government officials. The churches—take your pick from the eleventh-century Saint-Bénigne (stop 22), the twelfth-century Saint-Philibert (stop 21) or the thirteenth-century Notre-Dame (stop 8). MUST DO—on Rue de la Chouette (stop 9), it is considered good luck to rub the owl with your left hand and make a wish. The historic heart of Dijon is dominated by Place de la Libération—an enormous, semi-circular square, now lined with cafés, which was built to showcase a statue of Louis XIV. Ironically, the statue was melted down to make canons during the French Revolution. Opposite the square, is the Palais des Ducs et des États de Bourgogne (Dukes’Palace)—built in the fourteenth century but continually restored and enlarged over the following five hundred years. Today it houses the Town Hall and the Musée des Beaux Arts, where the tombs of the Dukes can be viewed. Alongside the Palais des Ducs and accessed via the Tourist Office below, is the 48 metre high Tour Philippe le Bon. Climb to the top for magnificent views over the rooftops of Dijon and an aerial view of the medieval centre nestled in the heart of the city. Dijon is positively packed with outdoor cafés and no matter where you are, a good meal is close by. Place de la Libération—there are many cafés lining the square and offering good value meals throughout the day. Place Emile Zola—today the square is crammed with cafés, but following the French Revolution, this was the site of public executions. Place François Rude—a relatively new addition to the city (1904), this quiet spot near the medieval heart of town is a great spot to while away an hour or two. If you haven’t arrived in Dijon by walking along the Burgundy Canal, now is the time to take a short detour to the outskirts of town and visit the port. If you have a copy of the Owl’s Trail, the Moses Loop will take you in the right direction. Follow this path through the Jardin des Sciences de l’Arquebuse with its traditional, English and botanical gardens. When you reach the far side of the park, continue along the Moses Loop but instead of turning right, zigzag left, then right towards the canal. When plans for the Burgundy Canal were first drawn up in the sixteenth century, the intention was to connect Dijon with Saint-Jean-de-Losne, thirty kilometres (nineteen miles) to the east. From there, boats could reach the Mediterranean Sea via the Saône and Rhône Rivers, ensuring Dijon’s role as a town of great economic importance. Subsequent plans to extend the canal west to the Yonne River were discouraged by the ruling nobility, believing that Dijon would become just another town along the way. 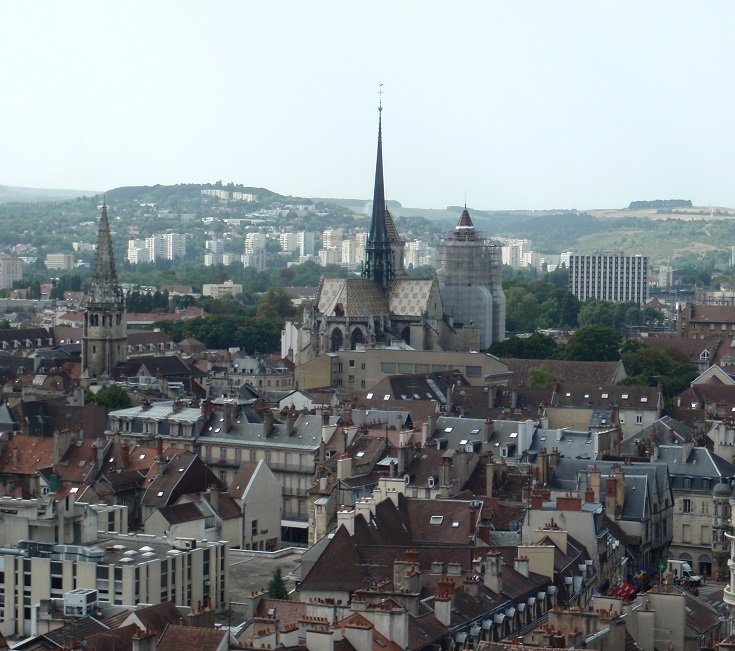 Dijon’s economic importance may have diminished over the last few hundred years but it is certainly a most worthwhile stop on any tourist route. Dijon is located 212 kilometres (132.5 miles) along the Burgundy Canal – an eleven-day walk from the starting point of Migennes. 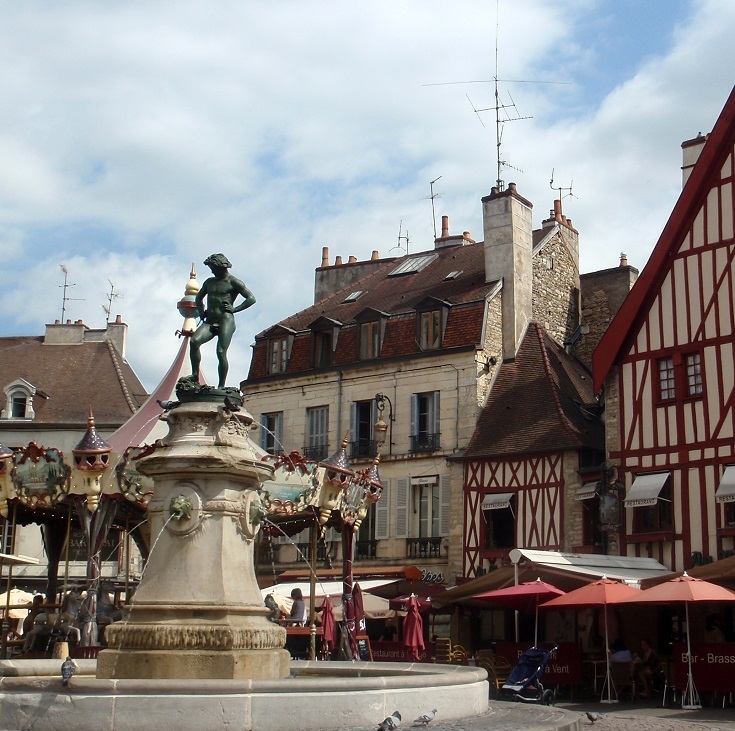 Good bus and train connections from Dijon to other parts of France offer several opportunities to explore the region more widely – or to finish your walk here if your time is limited. The Burgundy Canal winds along the southern edge of the town and the historic centre is an easy 15-minute walk from the canal. 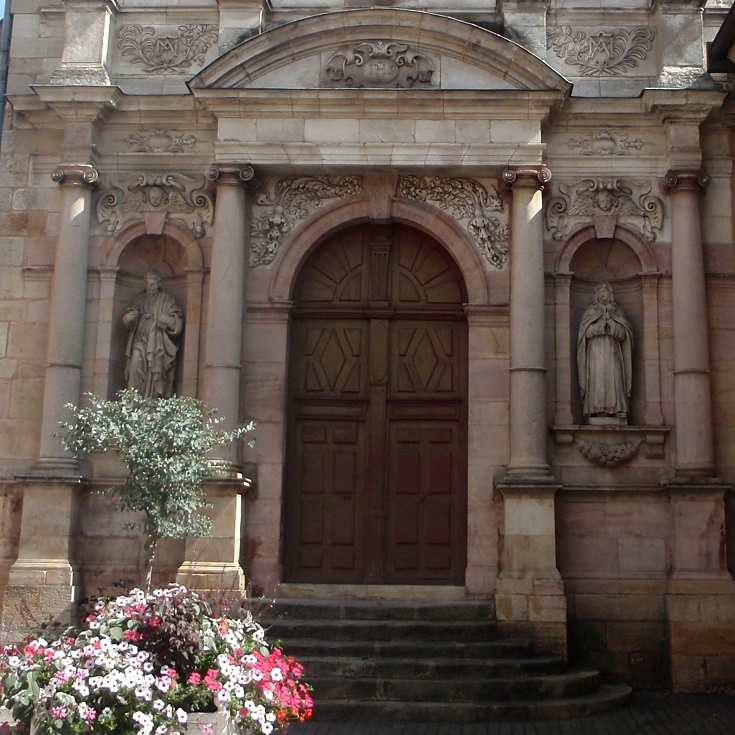 You’ll find the Tourist Office in the historic centre of Dijon at 11 Rue des Forges. Opening hours are listed here. You’ll find dozens of hotels, ranging from 5-star luxury accommodation to clean but basic 2-star rooms, on the Destination Dijon website. I can personally recommend Quality Hôtel du Nord which is conveniently located within walking distance of the train station and the historic centre. Listed below are five chambres d’hôtes (the equivalent of the English Bed and Breakfast) where you’ll find a warm, friendly welcome and personal service. There is a full range of cafés, bakeries, supermarkets and speciality food stores in Dijon – as you’d expect in any large town (population 150,000). Fresh food markets are held in Les Halles (Rue Odebert) every Tuesday, Thursday and Friday morning and all day on Saturday, but you’ll often find a smaller speciality market in full swing somewhere in town on other days of the week. Ask at the Tourist Office for a list of markets during your stay. Prices range from very affordable to quite pricey, depending on whether you visit for lunch or dinner and choose from the degustation or à la carte menus. Visit each website for menus, opening hours and all other details. We’re off to Dijon today. Thanks for the information. That does sound nice Tricia, I’ll have to go back in Springtime.